DIY: Spring Decorating Finds for Under $30 — CONTENT + CO.
With the arrival of the equinox, we’re inching closer and closer to spring weather. And even though our spring to-do list keeps growing longer and longer, I’m taking this weekend to focus a bit on our interior. We’re not big into seasonal decorating here at Content (unless we’re talking about Halloween which is a whole other can of worms). But, we do love adding small touches of something new, here-and-there, to ease ourselves and our Airbnb guests into the coming months. 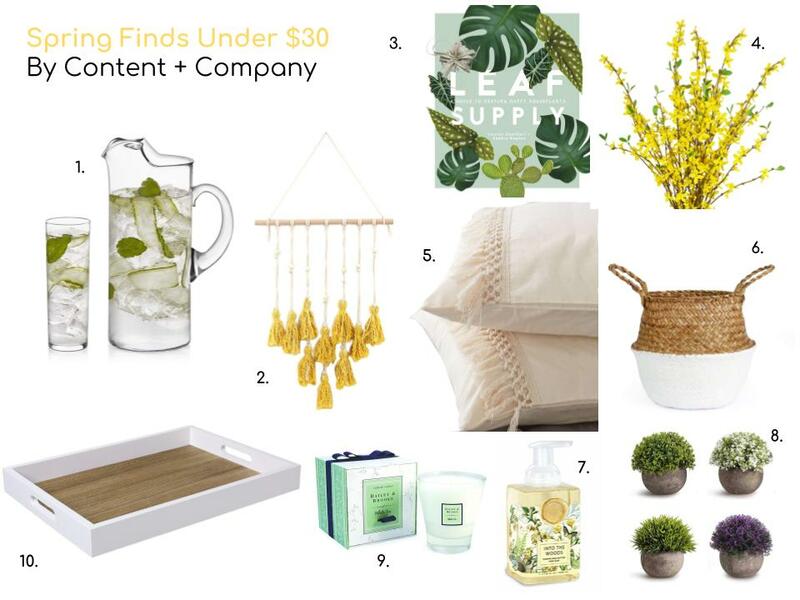 If you’re not a seasonal decorator either, we’ve come up with 10 Spring Finds that will have your home feeling fresh and inviting just in time for the warm weather - all under $30! In the living room place a structured base, like this white washed tray, on an existing table or ottoman. For a simple spring vignette, add a beautiful glass pitcher and glassware for entertaining and pair it with a bold coffee table book, topped with a small potted plant. In the bathroom, upgrade your everyday hand soap to a seasonal scent and add a beautiful spring floral candle for when guests visit.